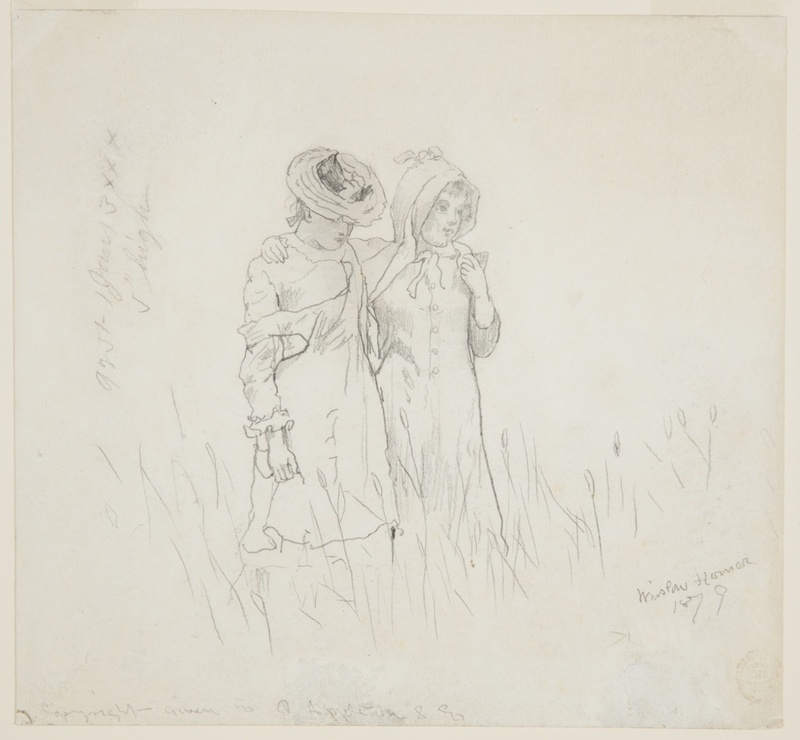 Winslow Homer’s graphite sketch, Two Girls in a Field, typifies the artist’s pastoral themes in the late 1870s and provides fascinating evidence of his creative process. The drawing shows two young girls strolling arm in arm through a meadow of tall grasses; one in a straw hat looks downward, the other in a bonnet, looks ahead and off to the left. Inscriptions ring three sides of the drawing: in the lower right corner, the artist’s signature and date, Winslow Homer/’79; at the lower edge, left: Copyright given to D. Appleton & Co; and lastly at the left and written sideways (not in the artist’s hand), printer’s notations: 9251, 1 Jan 3XXX/5” high. As suggested by the inscriptions, this sketch was used in publications, first in an illustrated article by George William Sheldon in the Art Journal (April 1880) and again in Sheldon’s book Hours with Art and Artists published by D. Appleton and Company in 1882. In 1879, when this drawing is dated, Homer produced a large number of graphite, charcoal, watercolor sketches and finished drawings of children in pastoral settings. In 1878 and 79, he had visited the farm belonging to his patron Lewis Valentine, drawing children on the farm and in the surrounding area as study models. These sketches form a family of similar themes, poses and compositions. The Cooper Hewitt graphite study relates to at least two other drawings in Homer’s oeuvre. Through the Fields (1879) is a graphite and white gouache finished, exhibition-size drawing that recently sold from the New York dealer, Questroyal Fine Art, LLC. This sheet more or less repeats the pair of young girls in the foreground as in the Cooper Hewitt study but sets them in a horizontal rather than vertical format. In the surrounding space, Homer creates a sloping hillside with four trees in the left distance that sets in relief the upper half of the girls’ figures. The third version of the theme is a golden watercolor in roughly the same horizontal format as the second drawing except the trees have been shifted. Additionally, the two figures have been moved back slightly allowing for more textured underbrush filling the foreground. Finally in a rare romantic gesture, Homer (?) adds a blue bird on a flowering tree branch in the left corner, perhaps as a spatial indicator and/or as an appealing element to prospective buyers. The existence of these very similar drawings within Homer’s oeuvre is not at all unusual. Early in his career when working as a journal illustrator, he learned to use the same motifs in several compositions in order to save time and increase his output. In an example from Cooper Hewitt’s Homer collection, the artist blackened the verso of Mountain Climber Resting (1912-12-98) and drew over the contours to transfer a figure to a second surface. Additionally, as drawings from Cooper Hewitt holdings show, Homer at times used carbon paper in between a top sheet and a lower sheet, probably with the intention of making copies for publication purposes or developing drawings to be used in a variety of compositions. Homer probably used one or other of these techniques in moving from one stage to another in the Two Girls in Field theme. The Cooper Hewitt Homer collection shows that however viewers may interpret his subject matter today, Homer appears to have been more interested in his artistic practice and the pragmatic details of his production than in the narrative meaning of his work. Recognizing that output was increasingly necessary for use in gallery and museum exhibitions, magazine and book illustrations, and working without a studio assistant, Homer was forced to create as much material as possible to cover all priorities. The theme of two girls in a field in his work is a good example this artistic process. Gail Davidson is the retired Curator & Head of Drawings, Prints & Graphic Design at Cooper Hewitt, Smithsonian Design Museum. Abigail Booth Gerdts has surmised that this drawing need not have been made especially for publication but could have been something the artist pulled from a group of drawings he had at hand in the studio. See Lloyd Goodrich and Abigail Booth Gerdts ed. Record of Works by Winslow Homer, 3 vols. (New York: Spanierman Gallery, 2008), vol. 2, no. 851, p. 259. See Gail S. Davidson, Landscape Icons, Tourism, and Land Development in the Northeast, “ in Gail S. Davidson, editor, Frederic Church, Winslow Homer and Thomas Moran: Tourism and the American Landscape (New York and Boston: Bulfinch Press, 2006), p. 48, p. 50, nos. 59, 60. For examples of Homer’s carbon-traced drawings see, Record of Works. vol. 2, nos. 810, 817, 818, 823, 828, 835, 840. You left your metro card at the shoe guy on west 72nd street. He has it on his counter.